Situated in Bricktown, the hippest area of Oklahoma City, guests can enjoy everything from sporting events to musical performances and historical attractions. Plus, guests can enjoy all this from the comfort of a hotel that shares the same energy as the surrounding area. 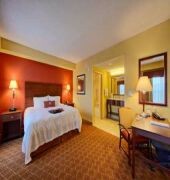 The hotel is within walking distance of the Ford Center Arena and the Cox Business Services Convention Center. Guests can reach the centre of Oklahoma City in around an 11-minute walk. 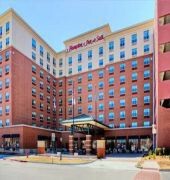 This hotel also offers easy access to the I-40, I-235, I-35 and I-44 highways and Will Rogers International Airport.FacilitiesThe hotel features 200 accommodation units. Guests of the hotel are welcomed in the lobby, which has a 24-hour reception and a 24-hour check-out service. The upper floors are easily accessible using the lift. Amenities include a cloakroom and a safe. Internet access and wireless internet access are available in the public areas. Gastronomic options offered by the hotel include a restaurant and a breakfast room. Parking facilities available to guests include a garage and a car park. Other services include a laundry.RoomsAll rooms feature air conditioning and a bathroom. Bathrooms with wheelchair access can also be booked. A king-size bed is provided in the carpeted accommodation units. A desk is also available. Tea and coffee making equipment is included as standard. In addition, there is a washing machine and an ironing set. Convenient features include internet access, a telephone, a TV, a radio, an alarm clock and wireless internet access. Wheelchair-accessible accommodation units are also bookable. In each of the bathrooms, guests will find a shower, a bathtub, a spa bath and a hairdryer.Sports/EntertainmentGuests can enjoy sport, leisure and relaxation options at the hotel. The hotel offers an indoor pool. A hot tub provides an opportunity for relaxation. 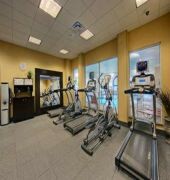 Leisure options available to guests include a gym. MealsBreakfast is bookable as a board option.PaymentAll major credit cards, including American Express, VISA and MasterCard, are accepted for payment.